With their unfortunately long legs, often hairy bodies as well as uncanny abilities involving near-invisible silk, spiders are not popular, and the media coverage they get does not usually help matters. But it looks like, finally, the tide may be beginning to turn. In recent months a particularly charismatic and charming family of spiders, the Salticidae or jumping spiders, has been attracting a lot of well-deserved positive attention on the internet, both in the shape of ‘Lucas’ the animated jumping spider as well as through videos of the magnificent courtship displays of the jumping spiders in the genus Maratus, which are known as ‘peacock spiders’ because of the way in which the males present their brightly coloured abdominal adornments. While most of the over 5000 known species of jumping spiders (including those in the genus Maratus) are confined to the tropics, there are still nearly 40 species which occur in Britain, all of which display the typical characteristics that distinguish the Salticidae from other spider families. 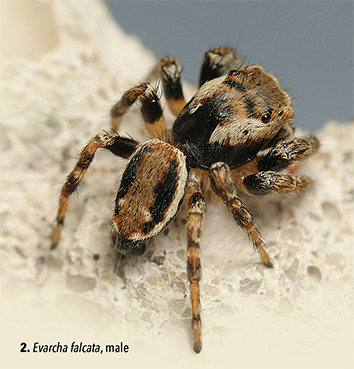 Their most distinctive feature are the four large, forward facing eyes, the middle two of which are particularly well developed (as illustrated by the female Evarcha arcuata in photo 1). This large pair of eyes allows jumping spiders to focus on objects and is believed to have full colour vision, while the smaller adjacent pair aids with depth perception as well as widening the field of vision. Jumping spiders, like the majority of other spiders, have a total of four pairs of eyes. In jumping spiders, the posterior two pairs are often small, with the fourth pair usually bigger than the third. In the distinctively patterned male Evarcha falcata shown in photo 2, for example, the fourth pair of eyes is clearly visible whereas the third pair is so small that it is difficult to see. These posterior two pairs of eyes are mainly used for detecting motion. As soon as a jumping spider notices a movementbehind it, it quickly turns around to take a closer look with its more powerful anterior eyes. 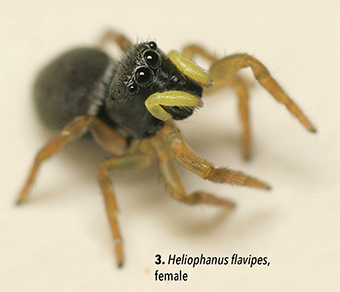 Jumping spiders like to thoroughly investigate any novel moving object, often turning their heads and/or bodies to follow it (as demonstrated in photo 3 by a female Heliophanus flavipes). This seemingly curious attitude and the movements associated with it are two of their most endearing characteristics. 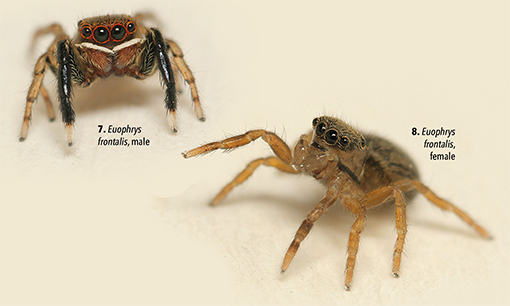 Compared to many other spiders, jumping spiders have relatively short legs (photo 4). Nevertheless, they are fast movers and accomplished jumpers, effortlessly covering distances many times their own body length in a single leap from a standing start. Rather than using large leg muscles to achieve this like grasshoppers do, jumping spiders utilize an internal hydraulic system. Only the rear two pairs of legs are used for jumping. The front two pairs are raised just before taking off (photo 5), and – if the jump is made in order to catch prey – they are then used to grasp the prey on landing. Jumping spiders attach a safety line of silk to the surface before each jump, so if their leap falls short or they lose their grip when landing, they do not fall far and can safely return to where they came from. In many species of jumping spiders it is easy to tell mature males and females apart based on their colouration and/or patterning. In Evarcha arcuata pictured in photos 4 and 5, for example, the males are very dark with a pronounced metallic sheen while the females are much lighter with a more defined pattern. On closer examination it also becomes obvious that male jumping spiders, like most other male spiders, have larger, more bulbous pedipalps (the short pair of appendages just in front of their legs) than the females (photo 6). These enlarged appendages are of a very intricate microscopic structure and are used for transferring the male’s sperm to the female during mating. In some species, such as the tiny (< 3mm) but unmistakable male Euophrys frontalis (photo 7), they (along with the first pair of legs) also play a role in the early stages of courtship, when the male attempts to attract a female by waving and gesturing. 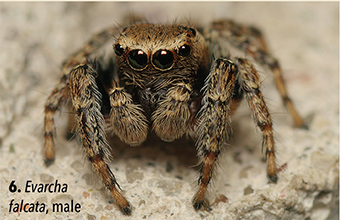 As in most other jumping spiders, the female of this species is slightly larger than the male (< 5mm) (photo 8). Brightly coloured pedipalps are also found in several species of the genus Heliophanus, including Heliophanus flavipes (pictured earlier) and Heliophanus cupreus (photo 9). In Heliophanus, however, the colourful highlights are not a male prerogative. Instead, depending on species, either both sexes or just the females possess the colourful appendages. The Latin name of this genus refers to their particularly sun-loving nature, a trait which is shared by all jumping spiders. When the sun is out they are exceptionally active and agile, but on rainy days they hide away in little self-constructed silken shelters, where they also spend their nights. These shelters are also used for protection during their moults, and the females lay and guard their eggs there. 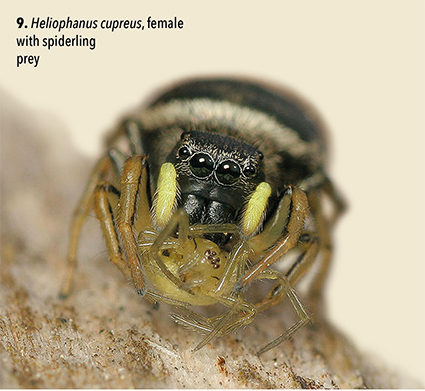 Jumping spiders feed on a wide range of prey, including other small or juvenile spiders (as shown in photo 9). Having spotted a potential meal, they slowly move towards it until they are close enough to pounce. As they often have to stalk their prey in dense vegetation, finding a good vantage point from which to launch their attack can be difficult. Jumping spiders are able to memorize the position of their intended victim and take long detours during which they lose sight of their quarry in order to get into a good position. That an animal with such a small brain and relatively simple nervous system should have such advanced problem-solving abilities is surprising, and has been subject to intensive research. 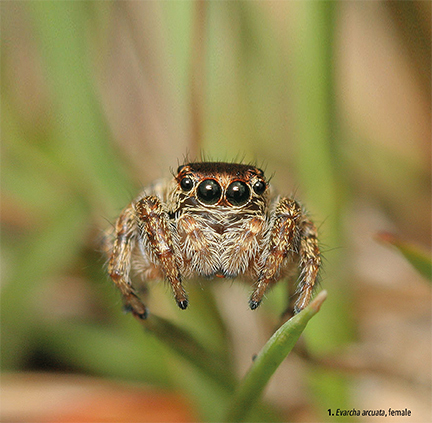 While some jumping spiders are quite particular as to their preferred habitat (for example, both Evarcha arcuata and Evarcha falcata are predominantly found in heathland), others such as Euophrys frontalis, Heliophanus flavipes and Heliophanus cupreus can be found in a variety of habitats, and some species can be quite common. But even in easily accessible locations where they occur in some numbers, jumping spiders regularly go overlooked because they are so small and often well camouflaged. The most frequently encountered species is probably Salticus scenicus (photo 10), which is also referred to as the Common Zebra Spider. This relatively large and very attractive species can reach a length of up to 7mm and has a predilection for sunny walls and fences. Another species that likes to take up residence on roofs and walls of houses, and occasionally makes its way inside, is the smaller (< 5mm) and less strikingly patterned Pseudeuophrys lanigera (photo 11). A third species which regularly occurs near human habitation is one of Britain’s biggest jumping spiders, Marpissa muscosa (photo 12). This rather impressive species can reach a length of up to 10mm and is very distinctive with its long and pointed abdomen. It is also known as the Fencepost Jumping Spider due to its affinity for this habitat, but it frequently inhabits dry stone walls as well, in addition to its natural habitat of large tree trunks. Not the biggest, but unquestionably the most unusual British jumping spider is Myrmarachne formicaria (photos 13 and 14). This fascinating species is an accomplished ant mimic, which not only brilliantly imitates an ant in its outward appearance but also moves like one, and even waves its first pair of legs in the air in front of it when walking, in the same way an ant carries its antennae. 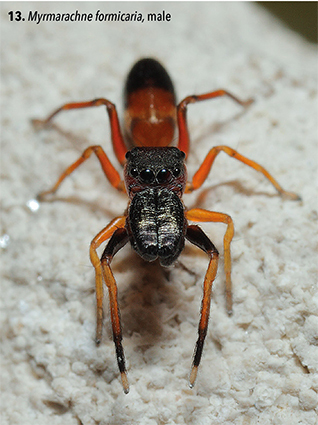 Myrmarachne formicaria always lives near ants and benefits from the fact that most predators avoid them wherever possible. 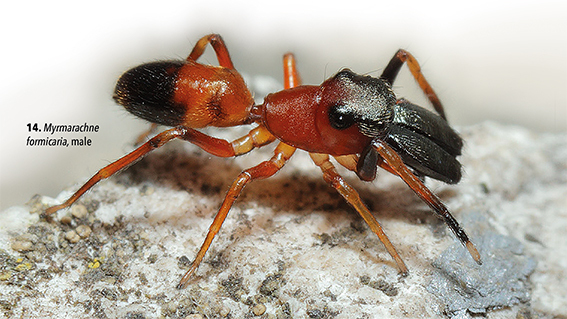 Like most other jumping spiders, Myrmarachne formicaria feeds on a wide variety of prey, but it does not prey on ants. As is the case with many small invertebrates, there is much that remains to be discovered about the habits and distribution of jumping spiders. Continuing developments in digital macro-photography and video are making it ever easier to get a closer look at, as well as record, these fascinating animals. Hopefully this fact, coupled with the recent positive media coverage, will help to overcome some of the common preconceptions and will encourage more observers to start exploring the mesmerising micro-world of these charismatic little spiders. Photos courtesy of Dr Tristan Bantock, entomologist and photographer.